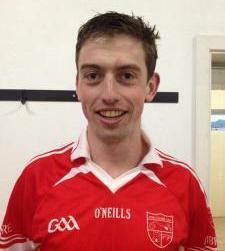 Midfielder turned full-back & all round gentleman, Daniel O'Riordan is a student accountant. He made his Championship debut against Canovee in 2010. Daniel's favourite food are golden wonders. His favourite TV show is Glenroe while his favourite pastime is leaving out the calves. Daniel also enjoys soccer, racing, rugby and jumping up on down on the trampoline. He considers his greatest sporting achievement to be winning the Under 12 County in 2002 against a fancied Kinsale side. His best club memory is getting a mars bar, packed of crisps and can of coke off Fr.Kieran after beating Kilmichael in the Under 12 Mid Cork Final after being 9 points down with 5 minutes left, above in Kilnamartyra. 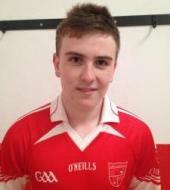 Daniel considers Ben O'Connor to be among the best players he has ever seen. If Daniel could change one thing in GAA - it would be to bring the Dubs out of Croke Park. When he was younger, he wanted to be Shane Galvin. The person he'd most like to meet is Willie Mullins, while he considers the best invention ever to be the wheel. Marooned on a desert island, Daniel could not be without Moses. You may not know this but Daniel is secretly good at ploughing.